Although the weather report yesterday said that it was going to be sunny today, the day started with lots of clouds in the sky. We have two brief showers – one in the middle of the day, and one just as we were getting into town for the evening. We left Twice Brewed, walking through Once Brewed and rejoined the trail. The names Once Brewed and Twice Brewed derives from the mid-8th century. During the construction of the Military Road, a farmer established a small brewery to slake the thirst of the road navvies and new passing traffic. The custom proved greater than expected, demand greater than the supply, so he watered down the beer. His customers, with understandable indignation, demanded it was brewed again – thus, “twice-brewed”. Once Brewed is attributed to Lady Trevelyan of Wellington Hall; when invited to formally open the youth hostel, she accepted with the provision that only tea and non-alcoholic drinks would ever be served – so “once-brewed” will always be the order of the day. Turning off the road, onto the path, we were met by the daunting site of the Steel Rigg, or “pointed ridge” and the dolerite cliffs of Peel Crag. The landscape in this area was fashioned by the progression of an eastward-moving glacier; creating Peel Gap, tapering the low ridges such as Steel Rigg, creating hollows below the crags where the laughs (natural lakes) have collected, and gnawing at the dolerite creating this impressive cliff line. Our path led us up the crags and down into the gaps between them. 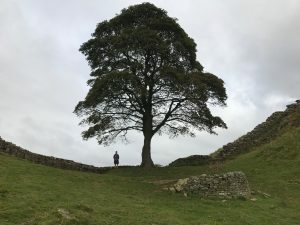 One rise brought us to an overlook of Milecastle 39, with its walls intact, and the walls of 16th century shielings (shepherds’ shelters) visible within the ruins of the Milecastle. Up another crag and down into Sycamore Gap, named for the presence of the stately tree. In the vicinity of this tree, a coin hoard from the 350s was found. This tree is also the spot featured in the movie “Robin Hood: Prince of Theives”, starring Kevin Costner, thus naming the tree “Robin Hood’s Tree”. The trail continued up Highshield Crag. Far below, we began to see Crag Lough, with its resident swans. Looking ahead, we could see Hotbank Crags – but first we had to climb down into Milking Gap. In the gap was HotBank Farm, and then we began the climb over Hotbank Crag. Next came the short ridge of Cuddy’s Crags, and then Housestead Crags. Along the way, we passed sections of the wall the turrets, and Milecastles. Milecastle 37, along Cuddy’s Crags, is rather special. Portions of the arch of the north gate have survived, showing the limits to the height of traffic from one side of the wall to the next. To the left of the archway, you can see the wall is 11 courses high, the highest minimally disturbed section of the original Wall on the entire frontier. Sixteenth century stock byres are also visible in the Milecastle. Heading toward Housestead, we passed through a small section of woods, were we had the opportunity to actually walk atop the Wall, as the Roman soldiers once would have done while patrolling. Once we reached Housestead Crag and Housestead Roman Fort, the rest of the group continued to walk along the path while I stopped to walk the grounds of the fort. Like most ruins, only the foundations have survived. I did learn that the food house (storage house) was the only building that had a raised floor. It was to keep the water and rodents away from the food stock. This building was also on the highest and driest area of land in the fort. Leaving the fort, I quickly caught up to the group as we crossed some fields, climbed Clew Hill and Kings Hill, passing through King’s Wicket (otherwise known as Busy Gap) and climbed Sewingshield Crag. I believe this was the highest (and longest, but not steepest) climb of the day. From the top of Sewingshield Crag, we could see all the crags back to Peel Crag (if I counted correctly). It looked so far away! Hard to believe we had already walked all that distance. At the top of the crag, there was an old Ordnance Survey pillar that we used for a group photograph. Walking down from the crag-top, we followed more sections of the wall and another Milecastle. This Milecastle did not have a north gate, as the north entrance would have led to the edge of the cliff! Just east of the Milecastle was a Grave cost beside the Wall. We continued walking past Sewingshield farm which was built entirely out of Roman stone. As we continued past portions of wall, turrets and another Milecastle (Milecastle 34), which has a grove of trees growing inside its boundary walls. The next couple of miles were along a very flat (but windy) track that went between the wall, and the wall ditch. In fact, we went down into the ditch area to seek shelter from the wind for our lunch break. This long stretch finished at Carrow Farm, where the path veered around the back of the farm, into a very muddy cow pasture and across a muddy field. The path then took a turn across the Military road, across a field and across a rush-filled spring. This spring is where the Celtic deity Coventina was worshipped by the Romans. When excavated, Coventina’s Well was found to hold the most enormous hoard of offerings – including 22 altars and in excess of 16.000 coins covering the full period of Roman occupation. The well was for officers of lower rank. The higher ranking officers had a temple, Mithraism. Above this temple lay a civilian settlement and Brocolitia Roman Fort, which remains as a grass-covered earthwork. From Brocolitia, we traveled through several more fields and up the hill to Carrawburgh (whose name means “defended place near rocks”). These rocks were cast here by Roman excavation of the vallum. From this point, we traversed another field, following further portions of the wall – where we sat on the wall for a quick break. We followed the wall ditch around Warwick House (another building built from the Wall stone). From this point, we followed the road into Chollorford, then up to Hamshaugh, where we are staying for the night. I am tired tonight – and my feet were aching by the time we reached our B&B. It is hard to believe that we only have two more days of hiking left!